JOHANNESBURG – AFTER experiencing mixed fortunes in the Confederation of African Football (CAF) Champions League, teams from the Southern African Development (SADC) bloc will be eager to extend their leads atop their respective groups or close the gap on early pacesetters this weekend. 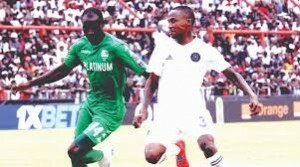 TP Mazembe of the Democratic Republic of Congo (DRC) and Tanzanian champions, Simba, opened their campaigns brightly this past weekend and hope to stretch their leads in Groups C and D away to CS Constantine (Algeria) and AS Vita (DRC) respectively. AS Vita Club hosts Simba at the Stade des Martyrs at 18h00 on Saturday. On the same day, CS Constantine and TP Mazembe will kick off at 21h00 at Stade Mohamed Hamlaoui in Algeria. AS Vita Club last weekend lost 0-2 to Egyptian Al Ahly SC while Simba beat JS Saoura (Algeria) 3-0 in Tanzania. Other SADC representatives are the South African duo of Mamelodi Sundowns and Orlando Pirates, as well as Zimbabwe’s FC Platinum. Pirates and Platinum occupy the last two berths in the Group B standings following their goalless draw in Zimbabwe. The South African side host Guinea side Horoya at the Orlando Stadium on Friday (18h00) while debutants FC Platinum have a tough assignment away to CAF defending champions Esperance at Stade Olympique de Rades in Tunisia (21h00). After their loss in Group A to Lobi Stars in Nigeria, 2016 CAF champions Sundowns must get their campaign back when they host 2017 victors Wydad Athletic Club of Morocco at the Lucas Moripe Stadium on Saturday. TP Mazembe (1967, 1968, 2009, 2010, 2015), AS Vita (1974) and Pirates (1995) are the other previous winners from the region.